‘Based on a True Story’ by Delphine de Vigan – The Mysterious Lady L.
Actually ‘Based on a True Story’ is a horror story with an atmosphere of menace with a malevolent undercurrent. The mysterious woman L. takes over Delphine’s life after Delphine has published her first successful novel. L. makes impassioned pleas to Delphine to write a memoir instead of fiction, that nowadays people only want what’s real. These pleas only leave Delphine with a severe case of writer’s block. L. even takes over Delphine’s personal computer sending out an email to all of Delphine’s friends begging them not to contact or bother Delphine because she is busy writing. She even signs Delphine’s name to the email. This email leaves Delphine virtually isolated and unable to write. 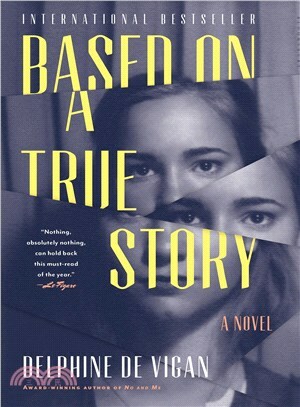 There are certain traits of the obsessed fan in ‘Based on a True Story’ that remind me of Stephen King’s ‘Misery’. My best guess as to who is this mysterious woman L. is that she is a double, a doppelgänger, of Delphine. ‘Based on a True Story’ is exceptional because De Vigan has created a fiction, a clever haunting story, with herself as the main character. Director Roman Polanski has made a movie from ‘Based on a True Story’ which also won the 2015 Prix Goncourt. I have thought a lot about the Reality versus Fiction debate and have come out strongly on the side of Fiction (no surprise there). I rarely read memoirs, finding them usually self-serving as is especially true of political memoirs. Nothing on television seems so fake to me as reality TV shows. My view is that fiction gives writers the necessary distance to tell the larger truths about themselves and their characters. I read fiction not for escape but to better understand the world and the people in it. I’ve read some mixed reviews about this book, but yours hits home for me – as metafiction rather than faction. It’s on my shelf – hope I can get to read it soon. I was already favorably disposed to Delphine de Vigan after reading her novel ‘Underground Time’ which I believe is one of the best novels about office life I’ve read. ‘Based on a Real Story’ has the creepiness of ‘Misery’ but is a more thought-provoking work. However the movie based on ‘Based on a Real Story’ did not score that well on IMDB – 6.2 – but that’s not the novel’s fault. I try to avoid reality TV as much as possible. I remember reading ‘Reality Hunger – A Manifesto’ by David Shields and thinking he was totally wrong-headed at the time. He was advocating that we drop fiction for something more reality-based. Fortunately his stupid ideas have fallen through. Read the original French, loved it! Wanted to throttle L. and save Delphine (from herself too!). Loved the debates about fiction vs reality, so argumentatively French. My thought was that L. was a physical manifestation of Delphine herself who represented the self-doubt and wrong ideas that entered Delphine’s mind when she was starting her second novel. I wouldn’t have thought about that, but it makes sense. It does sound rather well done. I have other Vigan on my radar but she’s clearly something of a talent. It would be difficult to beat ‘Underground Time’ as a novel about bad office life. ‘Based on a True Story’ is a creepy story about writer’s block. I was not quite as impressed with ‘Nothing Holds Back the Night’ which is a novel about her mother.